I SUPPOSE THE BEGINNING IS RELEVANT because I am quite old. When I was a small child, the world was an incredibly different place from what it is now. It was far less mechanized. The cities were much smaller and more densely packed together. There were no cars, so people could not go out and commute from suburbs; they could only travel by train. Even if you lived in a large city, as I did in London, it was possible to get out into untouched, heavenly countryside. I do not think that experience is as readily available anywhere now; it is something we have really lost. No longer can you hear the dawn chorus of birds. Even in the suburbs, it is nothing like it used to be; there were so many birds then that it was quite deafening. It saddens me that few people ever see the stars at night. Although parts of London were so dimmed by the street lights that I could not see the sky, when I did see the stars, I was awed. The occasional meteorite was tremendously exciting. I could not help wondering what it was like out there and what was to be found in outer space. Of course, as a child, I never dreamed that in the future I would actually be involved in that kind of enterprise. Things like that made life very different back in those days. There was far less in the way of material things, but much more of a feeling for nature and the w orld. You felt you were part of it. That more than made up for all the fancy things we now consider essential. Consequently, I do not worry about the loss of them should civilization collapse, as we would go back to a simpler and more natural lifestyle-assuming life endured. Nature was a source of unending fascination and delight for me. I shared my father's instinctive kinship with all living things and enjoyed our relationship with the natural world during our walks through the countryside. I felt so strongly about being outdoors that I did not just dislike going to school-I loathed it. On a lovely day in the summer, being trapped indoors felt like being imprisoned. I was free to explore the countryside only in my imagination. I lived in Brixton, a very rough part of London, equivalent then to Harlem in New York. Yet it had a wonderful public library where I learned most of my science. As a child, I would go there and get textbooks as well as fiction. Wade's Organic Chemistry was an early one that filled me with delight, and Dean's Astronomy and Cosmography was another. Of course, being so young, I did not understand half of it. But when you are inquisitive, any information soaks in like a sponge because the mind loves to be stimulated. Stuff went into readily accessible places to be retrieved later on in life. Nobody was instructing me, so I roamed across the sciences. I was interested in them all and did not perceive them as being separate. I was fascinated by biology because I liked to go out and watch the small organisms: newts, frogs, snakes, insects, and birds. I wanted to know about them, so I read about biology as well as chemistry, physics, astronomy, and so on. There were no barriers; it was just one amazing universe. It was so different from school, where the teaching of science is unbearably dull. Had I not stuffed my mind with it beforehand, I would never have taken any interest in it at all. For children, there is no separation between knowledge and experience. Separation is something artificial that adults use to segregate subjects; it is like intellectual apartheid. When you are a child, all knowledge is interesting. Outside, when I saw strange new things in nature, it was incredible. I remember seeing a pair of snakes, adders doing their dance. I did not know whether it was two males in a standoff or mates in a courtship ritual. They did circular dances on the ground and then suddenly came together, standing on their tails, looping around each other. It was just like the medical sign of the caduceus with intertwined snakes-the most wonderful sight. When I saw something amazing like that, I wanted to know more about it, so I went to the library to find out. I also loved making things, even as a little boy. We used to travel by train in those days, and I was interested in how fast the train was going, so I made an airspeed indicator I could hold out the window to measure the speed of the train. I calibrated it using the second hand of my grandfather's watch to measure how long it took to go between mileposts along the track. If there was something to figure out, I would invent an instrument to do it, rather than ask someone. It always seemed like a great challenge. We had very little money, so I simply used whatever I could find and discovered I could make things out of just about anything. I used to ponder about being marooned on a desert island and making a radio with nothing but the vegetation and rocks. My father was like that; he was very inventive and could fix almost anything. When I grew up to be an adult working in famous scientific institutions, if there was a question requiring an answer, there frequently was not the equipment available to ascertain the answer. Either we could not afford to buy it, or, as was more often the case, the equipment simply did not exist. There was nothing to do but invent it. Somebody once told me that inventions are exceedingly easy if you have a need; it is finding the need that is problematic. If you are a scientist, you always need to know something or other. It feeds back, because once you invent an instrument to make the measurement that leads to a new discovery, soon you will need a new instrument for that purpose and have to invent it. I have more than fifty patents on my inventions, and I have been surprised by the scientific discoveries they have enabled. For example, one I invented in 1957, the electron-capture detector, is still among the most sensitive of chemical analytic methods in existence. It revealed for the first time the ubiquitous distribution of pesticide residues in the natural environment. This information enabled Rachel Carson to write her book Silent Spring, which initiated widespread awareness of disturbance in the environment and subsequently led to the formation of the environmental movement. Later the same device enabled the discovery of PCBs in the environment. In 1971 I used it to determine the global distribution of chlorofluorocarbons, which are critical components in stratospheric ozone depletion. This evidence led to the discovery of the hole in the ozone. Most recently, the detector has made possible a system of atmospheric and oceanic tracer technology, enabling meteorologists to follow the movement of air masses. It is now being applied to ocean research. My family was not prosperous, so there was no prospect of my being able to go to university. I knew I had to have a degree as a sort of union ticket to get into a laboratory and do science. Consequently, I went to work as a laboratory technician. That way I was able to work during the day and go to university in the evening. It was not discouraging, as only 1 percent of the population in Britain then was able to attend university anyway. The firm I worked for was made up of true professionals. They would tackle almost any scientific problem within their area of specialization and anything to do with it. Chromatography covered a very wide range. The important lesson I learned from them was the necessity of doing science properly, never fudging or cheating in the least, even on little things. I remember the boss telling me I was doing a difficult analysis, and if I got it wrong, to tell him, so we could do it together until I got it right. Getting it right was important because people's lives could depend on it. If we gave a wrong analysis, it could endanger people and ruin the firm. It impressed on me that science is a serious business, and I must get it right. In the year and a half I was with them, I too learned how to be a real professional. When the opportunity of completing my degree became available, I went to the University of Manchester. Although it was a first-class science department, I was taught that it does not matter whether you comprehend the method or get results, as long as you understand what it is all about. That is the academic way. It dawned on me that students were being produced who were entirely unprofessional. They treated science almost as a business of passing examinations; it did not matter what you really did about it, whether it was right or not. In contrast, my work with the laboratory was a singularly formative time of having to do it right. I left the firm because World War II broke out. In London the war was an incredible experience-bombs and rockets were exploding around us like fireworks! Yet I think people who stayed in London found it an inspiring experience. It was frightening, but it was not so damaging that it destroyed us all. It made you stop worrying about whether you could pay the rent next week, because you did not know whether you would be here. I can understand why people continue to live on the edge of volcanoes-it adds something to life. During the war I worked at the National Institute for Medical Research. There were all sorts of problems, some of them related to the war: for instance, protecting troops against flash and flame. We devised quite a number of effective methods for that. There were also fearsome things such as working on the production of a vaccine to protect against a lethal virus expected to be encountered in Southeast Asia. It has a high mortality in people who are not used to it, so if you worked with it in the laboratory and caught it, you would die. It was extraordinary that in an institute in London, people were actually having to experiment with so deadly a virus. We had to help them devise methods to prevent the organism spreading and killing everyone. There was plenty of excitement. As a youth my curiosity ranged over everything, including medicine and physiology, but there was no possibility of my family being able to afford my education for a medical degree, because it was too long and costly. So I was happy to get a job at the National Institute for Medical Research. While I was there doing work on cross-infection in hospitals, I obtained a Ph.D. in medicine. The doc-torate is for research, not medical practice. I worked in all sorts of divisions of the institute: virology, physiology, biochemistry, experimental biology, and many more. In the twenty years I was there, I covered most fields of medicine. It was one of the best laboratories in the world. On the floor where I worked, my lab was shamed by being the only one not to win the Nobel Prize. That shows the scientific caliber of my colleagues along the corridor. In addition to the wonderful people, the working conditions were desirable. The chain of command was a bit like the Quaker church: all members were equal and responsible only to the director, who was a marvelous man. There were no set hours, and we were able to work on whatever we chose. I could not have had a better place to work. Yet, strangely, I found tenure stifling. The thought of life going down a railway track, straight to the grave, horrified me. I could not stand that, and I knew I would have to leave, but there were two problems. First of all, it was too good to leave. Besides that, the people were so extraordinarily nice that I did not want to cause offense by leaving. Having read science fiction all my life, I used to say that science is the business of reducing science fiction to practice. Quite out of the blue came a letter from the director of Space Operations at NASA, asking if I would join the Surveyor mission as an experimenter. I was invited because some of my inventions were just what they needed to analyze the lunar surface prior to the astronauts' landing. I was thus honorably able to leave the National Institute of Medical Research to join the National Aeronautics and Space Administration. As I was curious about the experiments to detect life on other planets, it was not long before I moved from the Moon Project to Life Detection on Mars. I was astonished at the low level of scientific activity going on in the biological side of the Mars Project. Eminent biologists who ought to have been taking part in the experiment were not interested. They were so obsessed with molecular biology and genetic evolution that they did not want to know about life. The discovery of DNA's double helix occurred at the Fitzer Institute when I was working there in Cambridge, so it was all part of our scene at the Institute for Medical Research. It was such a stunning discovery that it shifted scientific focus from the big picture to the small. Scientists became intensely reductionist; they wanted to go down to the molecules and atoms to study life. It is an ultramicroscopic view. It assumes the whole is never more than the sum of its parts. Therefore, by taking things to pieces, we can figure out how they work. There is no looking outward toward life as a larger thing, a worldwide phenomenon. You need the physiological top-down approach as well as the microscopic bottom-up approach. Science lacks wholeness of vision, so it is divided into separate expertises. The life sciences by their very nature necessitate synthesis, yet science is subdividing so rapidly that it is almost terrifying. At my last count, there were well over thirty different kinds of biologists, and they are all almost proud that they know nothing about the other branches of biology. Everyone is an expert in some specialized minutiae, so none of them talk to each other. With every year that goes by, new branches develop. Like those bifurcation diagrams in chaos theory, it is just going on into a complete miasma. This fragmentation is happening at a time when the need for synthesis is crucial. As a result, the study of life itself is almost nonexistent. In order to study life, first you need to ask, "What is life?" Life is not even listed in the Dictionary of Biology; it is not defined. Once you know what you are looking for, then you have to ask, "How do you recognize it?" Unfortunately, we did not know the answer to that before we looked for it elsewhere. There was a senior person at the Jet Propulsion Labs who was a nice but authoritarian man, whom people were a bit frightened of. One day, he called me into his office and asked, "What do you think of these life detection experiments?" I said I did not think much of them. Even if there were life on Mars, I thought there was a poor chance of finding it with the kind of equipment they were proposing to send. For the most part, scientists were just automating their own labs and sending them to Mars. That is not a good way of finding life somewhere else. I said so, and then he asked me what I would do. I replied that I would look for an entropy reduction on the whole planet. He laughed, saying that was a cop-out, because if the discovery of entropy reduction would indicate the presence of life, he needed to know how to do it. So I said, "Give me three days, and I will come back with an experiment for discovering entropy reduction." I returned with the idea of analyzing the chemical composition of Mars's atmosphere. It was based on the premise that if there was life on Mars, it would be obliged to use the atmosphere as a source of raw materials and as a depository for wastes, thereby altering its atmosphere and disturbing its chemical equilibrium. In 1965 I had a little paper in Nature called "The Physical Basis of Life Detection" that proposed physical tests for the presence of planetary life. One was a top-down view of the whole planet, instead of a local search at the site of landing. Using it, an observer on a spacecraft beyond our solar system could recognize that Earth is the only planet in our system that has life. My idea, when applied to what was known about Mars from infrared astronomy, suggested Mars was lifeless. Therefore it was not a popular experiment among scientists looking for life on Mars. NASA liked my approach, but the biologists did not. In the end, my experiment was never flown. The team thought they could get enough compositional analysis of Mars's atmosphere from a mass spectrometer attached to the Viking spacecraft. In fact, the instrument was too dedicated to analyzing the soil to look for life-characteristic substances. NASA was tolerant even though I raised a lot of flak by saying that what they were doing was pointless. They easily could have fired me, but they did not. They kept me employed, mainly as an inventor. I continued working in Britain, traveling back and forth as a consultant. I still have two pieces of hardware sitting on Mars now, devices that enabled the gas chromatograph mass spectrometer experiment to work. I have three plaques from NASA in recognition of this, so apparently I was of some use to them, apart from ideas that were not exactly politically or financially advantageous for NASA. The idea of "Gaia" was born in my mind in 1965 while I was at NASA in the Jet Propulsion Labs. It was a personal revelation, an idea that suddenly appeared like a flash of enlightenment. I was talking to Dian Hitchcock, an author-consultant there at the time, about the extreme difference between the atmospheres of Earth and Mars. As I was observing that Earth has such a reactive, unstable atmosphere, it suddenly dawned on me that an extremely unstable atmosphere could not stay constant unless something was regulating it. Somehow life keeps our atmosphere constant and favorable for organisms. Life on Earth not only created our atmosphere; it also regulates it. The next morning, I discussed my idea with the man who shared my office, Carl Sagan. He did not think much of my idea but said there was one thing in favor of it: did I know the sun had warmed up by something like 25 percent since life had begun on Earth? Then I realized climate regulation might have occurred as well as regulation of biospheric chemistry. Although the sun's energy has increased 30 percent during the three and a half billion years life has existed on this planet, Earth's surface temperature has remained constant. According to standard physics, the planet's surface should have boiled in the rising heat, rather than cooling as it has. Similarly, the chemical composition and concentration of gases in the atmosphere have remained stable. For example, the balance between oxygen and ammonia continues within the narrow range in which life can exist. Disastrous consequences would occur with minor shifts: an increase in oxygen of only 4 percent could ignite the entire atmosphere. Life can exist only under limited circumstances, which have been actively maintained by necessity. Living organisms must regulate the atmosphere in order to survive. Examining our overall atmospheric stability, I realized it is created by the planet itself. The reason biospheric conditions on Earth are optimal for life is that they are an extension of the living systems on the planet. When I first saw Gaia in my mind, I felt what an astronaut in space must have experienced seeing our home, Earth. I perceived Gaia as a single living entity consisting of Earth's biosphere, atmosphere, oceans, and land. Its entirety constitutes a feedback system that creates optimal physical conditions for life on this planet. It is a totality endowed with qualities far beyond those of its constituent parts. It differs from other living organisms in the way we differ from the population of living cells in our bodies. Gaia is the largest of living systems-it is our superorganism. In my estimation the greatest benefit from space research is not what we have learned about space; it is what we have learned about our own planet. For the first time in human history we have had a chance to look at Earth from space. That distant perspective revealed the planet as a whole, enabling us to see it as a single entity in which air, water, land, and life forms all combine as one. The photograph of Earth from space has become an icon. In addition to the image of Earth itself, photographs of other planets give us a new perspective on Earth. Mars appears to be a dead and barren place. It is so obviously lifeless, it looks like a slightly worked-over lunar surface. I used to argue quite a lot with my friend Carl Sagan, who would say, "How do you know there isn't life hanging on in an oasis somewhere?" I asserted, but never convinced him, that a planet could not have only sparse life. Life cannot exist in isolation. The planetary life system either takes charge of its chemistry and physics, whereby life flourishes, or the system degenerates into a state like that of Mars and Venus, and life is totally wiped out. Mars and Venus are permanently dead; they lack organic molecules and can never bear life. When it was first formulated, Gaia was just a hypothesis: "Let us suppose." It got better when I joined with the eminent biologist Lynn Margulis and we worked together on it. But when we tried to have our papers published, scientific journals refused to publish them. Scientists regarded our hypothesis as "dangerous," so we encountered strong resistance to our ideas. It is scientific heresy to propose anything that could be interpreted as teleological, that might imply the possibility of foresight, planning, and purpose in nature. As a result, it remained a hypothesis until about 1980. >From then on, it has become a theory, much more solid and sound, with quite a lot of supporting evidence for it. For example, if it were not for algae living in the ocean, there probably would be no clouds in the atmosphere, and our planet would be an enormously hotter place. The contribution of algal biochemistry to cloud formation is one of the geophysiological mechanisms involved in responsive climate regulation. One discovery is based on a model I created in 1981 called Daisy World, which put Gaia on the theoretical map. The planet's climatic consistency is comparable to our body temperature remaining constant whether we are in a hot or cold environment. The temperature regulation of the planet operates similarly to our own. Physiologists have grown interested, and, to their great surprise, they have found that many of the physiological systems in our bodies that have puzzled them completely, such as the regulation of sugar in the blood by insulin, operate by a mathematical system very similar to my theoretical Daisy World. The physiological system that regulates our own bodies is comparable to the one I postulated as regulating the whole planet. When the famous physiologist Walter Cannon came across the same thing in the human body, he named it homeostasis, the ability to regulate. He called it "the wisdom of the body." You might just as well say Gaia is "the wisdom of Earth." It is perfectly natural that we should be similar to the planet on which we evolved. From the combined evolution of rocks, ocean, air, and organisms emerged the entity that is Gaia. Eventually we evolved within that entity. Organisms and their environment are so tightly coupled that they constitute a single system. This evolutionary system is an emergent domain of which the whole is more than the sum of its parts. It is emergent because the entire system working together has properties beyond a mere collection of its component parts. The way I explain Gaia theory now is as an offshoot of Darwin's great vision. There is nothing in Gaia theory that is contrary to Darwin; it just extends Darwin's idea of the evolution of organisms to include the parallel evolution of the environment. The Darwinian view was that life adapts to the environment it finds. The Gaian perspective is that not only does life adapt to its environment, but it also adapts the environment to itself, creating a home conducive to life. The planetary perspective that Gaia provides stresses the crucial relationship of the planet's condition to our own. If life contributes to creating the conditions for its survival, then enhancing living organisms improves our shared environment. Naturally, when an organism's functions are beneficial to the environment, it flourishes as its environment thrives. Conversely, destroying organisms diminishes the conditions enabling our survival too. Inevitably, any species adversely affecting its environment is doomed. When damage to the biosphere is global, then our collective organism, Gaia, is at risk. Unfortunately, my hypothesis is deliberately distorted by those destroying life to exonerate their behavior. They use it to claim that their destructive actions do not matter because "Gaia will fix it." But life cannot repair itself when it is dead! The irresponsibility of those who misuse science to misinform the public is a serious problem for society. Scientists are revolted by the misrepresentation of my theory by those with malign intent. But they also have difficulties with its more benign usage. For over a decade, I have been urged to have nothing to do with the philosophical implications of my theory. In the introduction to The Ages of Gaia, I give an account of a meeting we held in Oxford. I gave a talk about the planetary self-regulation going on at the moment. Toward the end of the talk, I simply said, "So, you see, it looks as if Gaia likes it cold." It was just a convenient way of saying the system operates better when it is at a low temperature. Afterward, a friend warned me, "You should never say things like that. It really upset the scientists around me, who said, 'Oh, he's gone back to all that mystical stuff.' "
I have been under enormous pressure from scientists to be "scientifically correct" (which is just like being "politically correct"). Sci-entists are intolerant of my mentioning anything nonscientific regarding Gaia. It has prevented me from expressing anything philosophical, as I did in my first book. I am not changing what I said in that book; I stick with it. So I say the first book, Gaia: A New Look at Life on Earth, is for the general public. And the second book, The Ages of Gaia, has been completely expurgated to take all such references out of it, for scientists who will not accept them. It is a di-lemma. I have not departed from the general views expressed in my first book; but, speaking as a "scientist," I have had to turn aside from those views, or scientists will not listen to me. I am an ordinary, old-fashioned, straight, hard scientist accused of being a mystic. When I was a student, I was asked if I had ever had a spiritual experience. I replied that living itself is a spiritual experience. A natural philosopher can be deeply spiritual; knowing the natural world intimately leads to a profound, loving relationship with it. People ask me about the philosophical implications of my theory, but I do not know. I think we live in a self-organizing universe. The formation of life was inevitable; it was not a chance accident. Gaia is a manifestation of life. Which brings us to the question of whether life will continue to exist on this planet. If that is questionable, we have to ask, "What shall we do now?" I have pondered this an awful lot. I am not sure it is in our nature to do much. Most people just project this century into the next and get the same story as in the last: it might go on as it is, getting more polluted and more uncomfortable, but still livable. On the other hand, I can think of lots of disasters that would change it totally. Natural disasters that did not matter as much one hundred years ago can now be devastating. To give a simple example, there is a volcano in Iceland that erupts every two hundred years, on average. When it erupted in 1783, it caused two years without any harvest in the Northern Hemisphere. In those days, there was only a fraction of the population there is now, some of whom could be fed on stored food. If the volcano erupted now, its effects would be devastating. People do not want to think about that. They know the greenhouse effect is heating up the planet and terrible things are going to happen as a consequence, but they do not want to give up driving cars, because driving is convenient. Yet the ultimate effect of spewing noxious gases into the atmosphere is like sitting in a closed garage with the car engine running, asphyxiating from toxic air. We are polluting and poisoning the planet as well as ourselves. People do not even do the simple things, like not eating fast-food burgers, which are made from beef raised on clearcut forest land. Rain forests are named so because forests are responsible for rain. Trees evapotranspire enormous volumes of water through their leaves, creating vapor clouds that condense moisture in the forest. Along with providing life-giving water, the cloud cover reflects sunlight back into the atmosphere, thereby cooling the climate. Without trees there is no rain. Without rain, the soil dies from erosion, and nothing grows. Where humid tropical forests are being destroyed, soon there will be vast, arid deserts with mean temperatures of 120ˆ F. This desertified land will encircle the globe, severely altering the climate for billions of people starving in the tropics. It will also damage the climate of the entire planet by destroying its natural cooling and air-conditioning system, causing drought, flooding, and famine around the world. This scenario is inevitable if we continue cutting trees and suffocating ourselves with greenhouse gases. There is a pervasive feeling of an ominous calm like that preceding a coming war or a tropical hurricane. We know what to expect from a hurricane, but we have no idea what is coming now. There will be surprising events that cannot be predicted. In addition to the gradual changes becoming apparent, a stressed system undergoes a sequence of abrupt events increasing in critical magnitude. We will rapidly approach the critical level of degradation of all Earth's natural ecosystems-when the whole system starts to collapse. It appears from our present behavior that we will not do anything about our problems until something awful happens. It has often been said that the only thing that could pull people together is a threat from outside. If we were to react to our internally generated threat (the consequences of what we are doing, instead of aliens coming in and attacking us), maybe we could save ourselves. Unfortunately, we would rather blame and fight the other guy, so I think it is going to take some dreadful catastrophes before people cooperate. We need a connection with something larger than ourselves. We have a collective identity, but it is not comprehensive enough. Most people are tribal: they identify with their own culture, religion, nation, or whatever. They do not care about their nation as long as they are all right. But when they perceive that it is under threat, it is amazing how unselfish they become. In wartime, they even give up their lives. It is remarkable. How do we draw on that strength to make it global? There is no use in talking about the human race or the United Nations, because, although such a union is a good idea, it does not move people the way their tribe does. Even environmental problems are blamed on other nations and used to score points in national politics. Such tribal conflicts are as dangerous and self-defeating as scientific and religious fundamentalism. The global environment encompasses us all, regardless of ethnicity, race, or nationality. Now, at the close of the twentieth century, there is little time left to remedy real problems affecting Earth. Confronted with global catastrophe, we can only hope there will be some new response in the human species. Environmental ignorance could be replaced with ecological awareness. We could shift our focus from short-term gain to long-term consequences. Instead of trying to manage the planet, we could manage ourselves. Our thinking could change from being human-centered to planet-centered. We could learn to live with Earth as part of it, by humbly receiving and giving the gifts that sustain all of us who live on this planet. Gaia could be a way to view Earth, ourselves, and our relationship with living things. To me Earth is alive, and I am part of it. People could think of Earth in that sense-we all belong to Gaia. James Lovelock. The Ages of Gaia. Norton, 1994. ---.Gaia: A New Look at Life on Earth. Oxford University Press, 1987. Nearly every day, the media recount stories about the degradation of the Earth's environment; these stories are met with alarm by some and with skepticism by others. Life Stories presents testimony from some of the world's top environmental scientists who have seen firsthand the sobering effects of rapid global change: the extinction of species, worldwide damage to ecosystems, and the increasing alienation of human life from the natural world. A moving celebration of nature, and a tribute to the role of science in preserving our endangered future, this exceptional collection presents the personal and professional reflections of sixteen eminent scientists. Their views on the meaning and relevance of their work are interwoven with inspiring autobiographical accounts of how formative life experiences led to their research, conclusions, and activities. 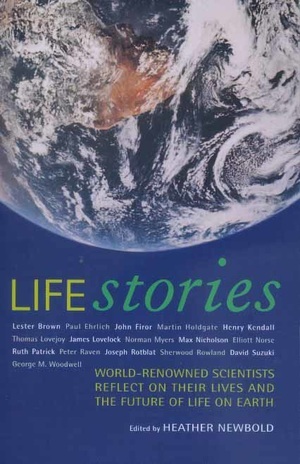 These narratives, based on personal interviews, are by such world-renowned figures as James Lovelock, originator of the Gaia hypothesis; Paul Ehrlich, author of The Population Bomb and founder of Zero Population Growth; Max Nicholson, a founder of the World Wildlife Fund; and Sherwood Rowland, who discovered the chemistry of atmospheric ozone depletion. These essays read like an intimate conversation with the world's top scientists. This collection also provides a view of the international development of ecology as a scientific enterprise. Life Stories demonstrates the important role of the scientific community in fostering worldwide awareness of the dangers facing the Earth today, and in seeking solutions for tomorrow. Young readers will find this book inspiring for the life stories it tells. Readers of all ages will find here a profound, urgent, and compelling message about the future of life on Earth. Heather Newbold is an independent scholar and writer. These brief descriptions necessarily omit many of these scientists' important achievements, awards, publications, and administrative contributions. Note, too, that the Nobel Prize is not awarded in the life sciences. Lester Brown was an international agricultural analyst with the United States Department of Agriculture's Foreign Agricultural Service, adviser to secretary of agriculture Orville Freeman on foreign agricultural policy, and administrator of the department's International Agricultural Development Service. He helped establish the Overseas Development Council, of which he became a senior fellow. In 1974 he founded the Worldwatch Institute to analyze global environmental issues. He continues to run the institute and oversee its research. In addition to books, a magazine, and periodic reports, it publishes the widely read State of the World reports. Paul Ehrlich, professor of population studies and president of the Center for Conservation Biology at Stanford University, has researched ecology, entomology, evolutionary biology, and behavior, doing fieldwork all over the world. With Peter Raven, he developed the concept of coevolution. Of his thirty books, the best known is The Population Bomb, which led him to found the organization Zero Population Growth. He is internationally known for presciently warning of the dangers of overconsumption and overpopulation for the carrying capacity of the planet. John Firor researched cosmic particle physics at the University of Chicago and then studied radioastronomy at the Carnegie Institution of Washington. His study of solar radio waves led him to the High Altitude Observatory in Boulder, which later became the base of the National Center for Atmospheric Research (NCAR). After being associate director in charge of solar research, Firor became director of NCAR and remained in management for over thirty years. His research contributions include solar-terrestrial relations, the physics of Earth's atmosphere, the impact of climate change, and policy use of scientific information. Martin Holdgate was chief biologist of the British Antarctic Survey, deputy director (for research) of the British Nature Conservancy, and first director of the Institute of Terrestrial Ecology. In Britain, he was the first director of the Central Unit on Environmental Pollution and then chief scientist of the Departments of Environment and Transportation. He was president of the Governing Council of the United Nations Environment Program and director general of the International Union for the Conservation of Nature/World Conservation Union. He is president of the Zoological Society of London. Henry Kendall won the Nobel Prize in physics for the discovery of quarks. A professor at the Massachusetts Institute of Technology, he researched meson and neutrino physics, nucleon structure, and high-energy electron scattering. He warned of safety hazards in the nuclear power industry, the dangers of nuclear weapons, and the impracticality of space-based weapons. He led the scientific community in assessing and developing means to control the adverse effects of advanced technologies. Until his untimely death, he was chair of the Union of Concerned Scientists, which he cofounded to conduct technical studies and provide public education to advance responsible public policies on issues in which science and technology play a critical role. He initiated the "World Scientists' Warning to Humanity" to bring public attention to the threats of global environmental degradation to Earth's life-support systems. Thomas Lovejoy directed the science program of the World Wildlife Fund-United States and undertook a giant experiment in Brazil's rain forest, the Minimum Critical Size of Ecosystems Project, which became the Biological Dynamics of Forest Fragments Project. Later he originated innovative debt-for-nature swaps for international conservation. He also started the popular public television series Nature. He is head of Biodiversity and Environmental Affairs for the Smithsonian Institution, science adviser to the U.S. secretary of the interior, and chief biodiversity adviser at the World Bank. James Lovelock, who has a Ph.D. in medicine and a D.Sc. in biophysics, worked at the National Institute for Medical Research in London. Later he collaborated on lunar and planetary research with NASA's Jet Propulsion Laboratory. His interdisciplinary research covers such broad fields as medicine, biology, geophysiology, and instrument science. He has filed over fifty patents for his inventions, and one, the electron-capture detector, first revealed the ubiquitous distribution of pesticide residues, PCBs, nitrous oxide, and the CFCs responsible for atmospheric ozone depletion. He is best known for originating the Gaia hypothesis. Norman Myers initially documented the destruction of the world's rain forests and then identified and originated the strategy of conserving biodiversity "hot spots." As a conservation biologist and ecologist and international consultant on sustainable development, he has worked in over eighty countries on issues as varied as mass extinction of species, tropical forests, savannahs, and grasslands, global warming, population growth in developing countries, resource waste in developed countries, environmental economics, and the environmental dimensions of national and international security. Max Nicholson, renowned conservationist, helped establish the Edward Gray Institute and the British Trust for Ornithology. He drafted "A National Plan for Britain," the basis of a socioeconomic group PEP (Political and Economic Planning). After World War II he was head of the office of the deputy prime minister. When the government created the British Nature Conservancy, he became its director general. Later he was a founder of the World Wildlife Fund/World Wide Fund for Nature. He also started and was chair of Earthwatch Europe and was head of the world conservation section of the International Biological Programme. Elliott Norse was a marine biologist with the Environmental Protection Agency before becoming staff ecologist for the President's Council on Environmental Quality. Later he became public policy director of the Ecological Society of America and opened its Washington, D.C., office. He then compiled two books on American forests for the Wilderness Society. After being chief scientist at the Center for Marine Conservation, he founded the Marine Conservation Biology Institute to advance interdisciplinary research and collaboration in the emerging field of marine conservation biology. For further information, contact the Marine Conservation Biology Institute, 15806 NE 47th Court, Redmond, WA 98052. Ruth Patrick's extensive research on diatoms led her to expand her study of their taxonomy, physiology, and ecology to an analysis of the aquatic environments that they inhabit. She invented the diatometer to detect pollution in freshwater conditions. Her field research focused on the biodiversity of rivers and how these ecosystems function under natural and polluted conditions. She founded the Limnology Department (now the Environmental Research Division) at the Academy of Natural Sciences in Philadelphia and later became chair of its board of trustees. Peter Raven is director of the Missouri Botanical Garden, where he has developed botanical field research programs undertaken around the world, as well as the Center for Plant Conservation, a national consortium to preserve endangered species. In addition to heading a variety of international projects and committees, he is home secretary for the National Academy of Sciences and has convened studies for the National Science Foundation and the National Research Council on systematic and evolutionary biology and ecology, biodiversity, and other related interdisciplinary research. Joseph Rotblat, a nuclear physicist, was the only scientist to leave the Manhattan Project on principle. Ever since resigning, he has campaigned for nuclear disarmament and organized scientists for arms control. He chaired the press conference for the Russell-Einstein Manifesto, was cofounder of the Atomic Scientists Association, organized and still heads the Pugwash Conferences on Science and World Affairs, cofounded the Stockholm International Peace Research Institute, and was president of the International Science Forum, in addition to heading organizations in the field of nuclear medicine. In 1995 Joseph Rotblat and Pugwash were awarded the Nobel Peace Prize. Sherwood Rowland created and was the first chair of the chemistry department of the University of California's Irvine campus. Previously he researched radioactive atoms and developed the subfield of tritium "hot-atom" chemistry. When his interest in chemical kinetics and photochemistry led him to determine the atmospheric fate of chlorofluorocarbons, he discovered that they were destroying stratospheric ozone. Realizing the environmental consequences of ozone depletion, he testified in legislative hearings to regulate CFC production. In 1995 Rowland and his colleague Mario Molina won the Nobel Prize in chemistry. David Suzuki was a professor at the University of British Columbia, doing genetics research, before he began his syndicated newspaper column, the radio program Quirks and Quarks, the television series Suzuki on Science, and the ongoing TV series The Nature of Things. In addition to producing over one hundred major research papers and textbooks, he has written twenty-five popular books. In 1989 his five-part Canadian Broadcasting Corporation radio series about the global environment, It's a Matter of Survival, brought such an impassioned public response that he started the David Suzuki Foundation to find solutions and create sustainable communities. For more information, contact the David T. Suzuki Foundation, 2211 West Fourth Avenue, Vancouver, B.C., Canada V6K 4S2. George M. Woodwell studies the structure and function of natural communities and their role as segments of the biosphere. He also investigates biotic impoverishment, especially the circulation and effects of persistent toxins, the ecological effects of ionizing radiation, and biotic interactions related to global warming. He was the founder and director of the Ecosystems Center at the Marine Biological Laboratory in Woods Hole, Massachusetts, and also of the Woods Hole Research Center for global environmental research and policy. He was a founder of the Environmental Defense Fund and a founding trustee of the Natural Resources Defense Council and the World Resources Institute. He has headed many groups and was chair of the World Wildlife Fund and president of the Ecological Society of America. He also headed the Nuclear Winter Symposium, the conference on the long-term biological consequences of nuclear war. An expert on the basic metabolism of ecosystems and the global carbon cycle, he contributed substantially to the "Framework on Climate Change" adopted at the Earth Summit in Rio de Janeiro, and he established a World Commission on Forests to protect all of Earth's forests.